The flowers, the garden tips, the food, the music, and more! This month’s Blogorail Red Loop is featuring the magic you can expect at the 2017 Epcot Flower & Garden Festival. This entry was posted in Walt Disney Wednesday, Walt Disney World and tagged epcot, flower and garden festival, garden rocks on March 1, 2017 by kim051172. Welcome to this month’s Blogorail Green Loop. Today we are taking a closer look at the fun you can find in Future World at Epcot. 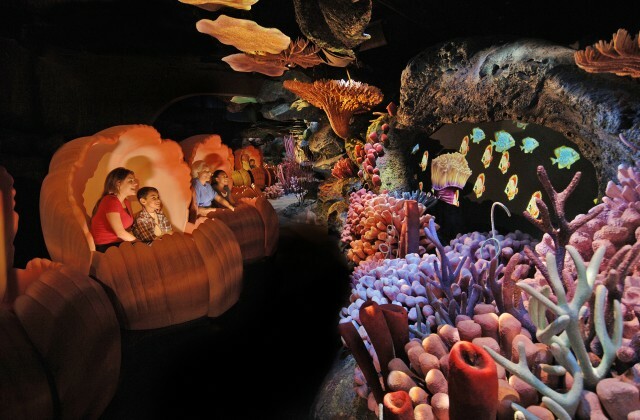 Odds are, if you’ve been to Epcot, you’ve visited The Seas with Nemo & Friends. Many visitors, though, barely scratch the surface (or the deep) of this amazing pavilion. We’ll start with the main attraction, The Seas with Nemo & Friends. This is a darling slow moving ride in which guests climb in a “clamobile” to enjoy scenes from the movie. In addition to the animated scenes from the movie, due to the magic of Disney, Finding Nemo characters can be seen swimming among real fish. Another popular attraction is Turtle Talk with Crush. It often takes a few minutes for new visitors to realize that yes, Crush is actually talking to the people in the auditorium! He answers the audience’s questions about life in the ocean and refer to people’s shirts as their shell. Kids and adults alike love this interactive show, which lasts about 15 minutes, and it’s a really great way for kids to learn about sealife. New this summer, Crush will also be introducing friends from Finding Dory so now he’ll also be answering questions about whale sharks like Destiny, beluga whales like Bailey, or octopuses (or septopuses) like Hank. Most visitors will also wander around SeaBase to see the animals. Disney participates in manatee rescue and conservation and the resident manatees are always a hit. Love dolphins? They have those, too. There is also the giant coral reef home to numerous fish, several species of shark, sting rays and sea turtles. If you’d like to see something extra, catch a fish feeding at 10:00am or 3:30pm daily. There’s also an area for kids to explore. My son loved hanging out in Bruce’s mouth! Want to dine among the animals? There is a great table service restaurant, the Coral Reef Restaurant. There are huge windows that look into the same aquarium with the fish, sharks, sting rays, and sea turtles. If you’re lucky, you might also catch a scuba diver or even a scuba Mickey. Of course, these are all the locations that most people visit and like I said, this barely scratches the surface (or the deep) of this amazing pavilion. There are also several tours (for an extra charge) that will take you behind the scenes and as I’ve been on all of them at least once, I can tell you these tours are absolutely amazing and worth the extra money. Before discussing the individual tours, though, I just want to mention that being behind the scenes at this pavilion is incredible. You’ll see the massive filtering system, animal care areas, how they move the manatees in and out, kitchen and feeding schedules, and more. It truly gives a much more in-depth explanation of what all is involved to keep this pavilion running and the animals healthy. In addition, there is nothing like seeing the aquarium from its surface. It is huge!!! All of the water areas are actually just walled off sections of one giant tank. Since 5.7-million gallons is difficult for most people to picture, look at it this way, its diameter of 203 feet would easily accommodate Spaceship Earth with 20 feet on either side to spare. The water pressure is so great that the acrylic viewing panels are at least 6 – 8 inches thick, which is much more noticeable from in the water. Now, on to the tours. Guests 13 and older can interact with those lovable marine mammals on the Dolphins in Depth tour. Guests will visit the dolphin areas learning how these mammals are cared for and what they eat. This is done down to a science as each animal has their own diet. The highlight of the tour, of course, is the 30-minutes spent in about waist-high water interacting with the animals. While the dolphins have to “choose” to come to the guests for the interaction, they must love it because they always do and with a limit of 8 guests on the tour, each guest is sure to have a great experience. Best thing about this tour compared to the others? Nonswimmers can enjoy it, too. Epcot Seas Adventures – DiveQuest. I’ve gone SCUBA diving in the Caribbean, Hawaii, Mexico, and there just is no way to see the collection of marine life in the wild that can be seen here. It truly is incredible. The first time I did this tour, I was a little leery of the sharks, but after a few more times, I’ve gotten more daring. Touching them is prohibited (and ill-advised), but if one kneels at the bottom of the tank near their swim pattern, they will swim right around you. My other favorite thing to do on this tour? Interact with the guests outside of the tank! Kids seem to love SCUBA divers and they are constantly waving to you and wanting to interact with you. For me, it’s a great way to share my experience with them. I often spend a lot of my dive around the viewing windows for that exact reason. If a diver’s family is available in the viewing windows, the videographer (divers can purchase a DVD of their dive at the end of the tour) will make it a point to film the diver with his or her family. One of my favorite moments was when my son was small, he put his hand to the window on the outside and I put my hand up to his on the inside and the videographer caught it. Of course, to enjoy this tour guests must be SCUBA certified and at least 10 years old. 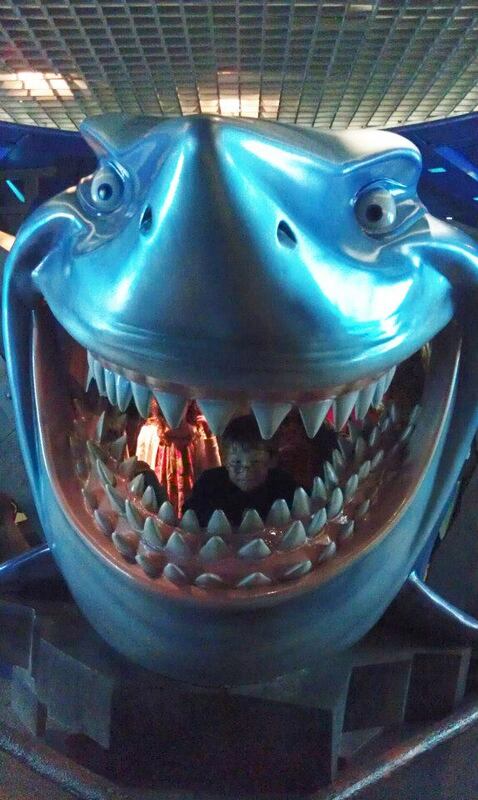 I’m sure you can now see why I’ve spent hours and hours inside Epcot’s The Seas with Nemo & Friends. Many guests only give it a walk-through and miss out on some amazing memories and learning experiences. I hope you’ll give it more time and even take one of the tours on your next visit. 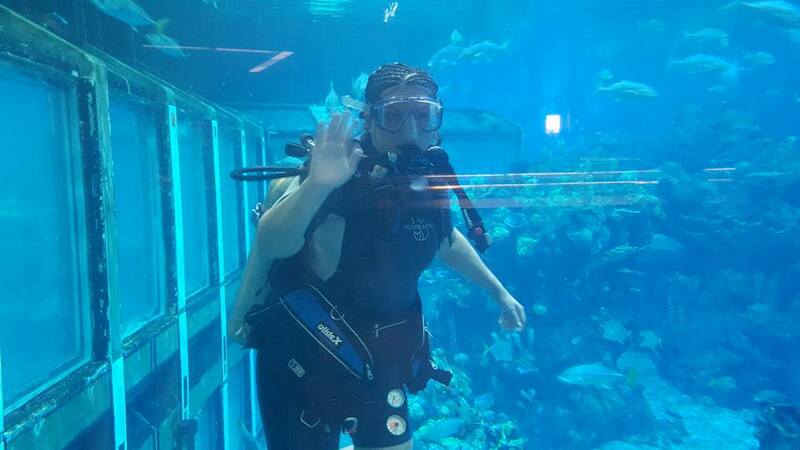 This entry was posted in Walt Disney Wednesday, Walt Disney World and tagged aquatour, coral reef restaurant, disney world tours, divequest, dolphins, dolphins in depth, epcot, scuba, the seas with nemo & friends, turtle talk with crush on July 13, 2016 by kim051172. Wandering around Epcot’s World Showcase is one of my favorite things to do at Walt Disney World. I enjoy speaking with the Cast Members from each country. It’s fun to practice my Spanish skills in Mexico and my German skills in Germany. My favorite pavilion to visit, though is Morocco. This entry was posted in Walt Disney Wednesday, Walt Disney World and tagged epcot, morocco, restaurant marrakesh, walt disney world, world showcase on March 9, 2016 by kim051172. This entry was posted in Downtown Disney - WDW, Walt Disney Wednesday, Walt Disney World and tagged animal kingdom, dining, disney springs, epcot, magic kingdom, restaurant marrakesh, walt disney world on February 24, 2016 by kim051172.